Welcome! Our website is fully integrated with online ordering and secure checkout! Our mission is to provide you the highest level of customer service and care before, during, and after the sale. Please, have a look around and let us know how we can assist you and your dog during this time. We are about helping you make memories. So let's do this right. RUFF ROLLIN' Wheelchairs for Dogs is a family owned company founded in the heart of the Northern Rockies, in Bozeman, Montana. 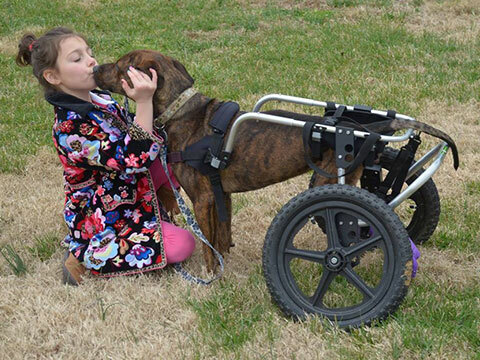 Each dog wheelchair is custom designed and hand built with the highest quality standards. Our adjustable, lightweight dog wheelchairs all have a lifetime warranty and fit dogs of all shapes and sizes. We also carry a range of natural pet products to help care for your disabled dog. We are committed to one thing; we will provide you and your dog with the best possible experience during this difficult time.